Moscow saw its biggest November snowfall in 50 years late last week. 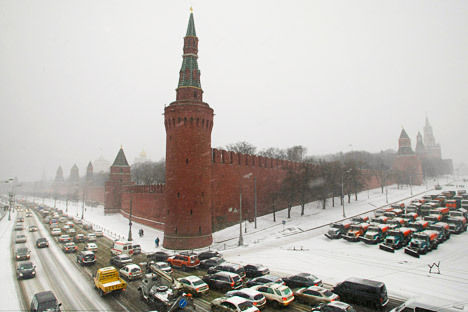 Moscow had its biggest November snowfall in 50 years late last week, according to City Hall. To the pedestrian, it was beautiful. The white snow reflected the lights, making the darkness of early winter more tolerable. After dinner Thursday, several other American journalists and I had a snowball fight - something I haven't done since I moved to Washington where it rarely snows, thanks in part to global warming. Things were worse if you traveled. Traffic jammed from 40-200 kilometers, according to Kommersant, on the road from Moscow to St. Petersburg in the Tver Region. People ran out of fuel and food. Volunteers walked between the cars, trying to give water to the stranded, many of whom were truck drivers. One volunteer said that the governor of Tver Region allegedly tried to threaten them with arrest on charges of drug dealing. But in the warmer enclave of Moscow, the temperature rose above freezing, causing the estimated 20 centimeters of snow to melt rapidly. The walk from my office to Savelovsky Vokzal was an obstacle course, and since it was dark, you couldn't see the obstacles. Step on what you thought was snow and it was a huge puddle of melted snow and exhaust. Cars inched along the roads in rush hour, slogging through puddles as deep as their tires. One entrance to a perekhod had black water streaming down it into a grate. The Metro was running without problems. The trains arrived within seconds of each other but were still full of people. I should add that our own infrastructure in America has its own problems. During Hurricane Sandy, the Washington Metro and New York City Subway shut down, and in New York, stayed closed for days and major highways and tunnels were closed. But the warm weather did not last forever. Tuesday, it was snowing heavily again and more traffic jams were reported.